This is why I have a massive, First Aid Kit fully stocked at home and a mini matching one for out and about. As let’s face it, being out and about exploring is where most of the accidents tend to happen. My kit has all the usual suspects in it and is tailored for our family’s specific needs like asthma inhalers and it’s something I have always prided myself on being organised with (because in general day-to-day life being organised and I don’t really go that well together, ha ha). I remember a friend telling me when her kids were little they went away for the night and her daughter had a raging temperature, they hadn’t brought any Panadol and they were hours away from a A&E. Thankfully her little girl came through it but it was a really scary night for them all. Once I heard that I made sure to always be stocked with the necessaries at home, in my car and if the car was staying at home in our luggage. Funnily enough, a few years after hearing that story the same thing happened to Oscar overnight whilst we were staying in the middle of nowhere and I was so glad I had the necessary medication on hand. 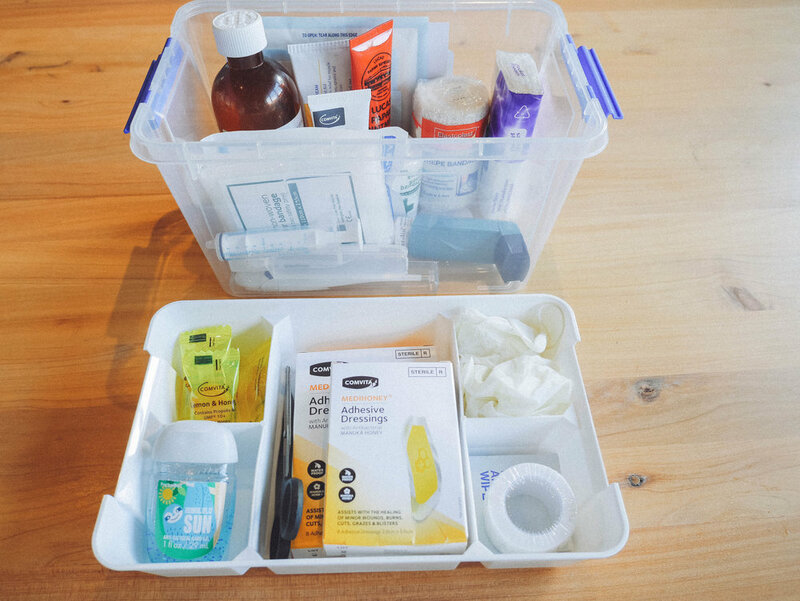 So how organised are you when it comes to first aid? Here is my on-the-go and at-home kits for you, and I have to share my favourite new product we have added to it. I’m a consumer and I love to try out new things, especially when it’s an improvement on an old favourite that will help my kids heal better. I’ve been a big Comvita fan for years, we have their lozenges, honey and use their winter wellness elixirs to fight off nasty coughs the twins get over winter. So I was so happy to see they released the very clever Medihoney Adhesive Dressings to treat minor wounds, burns and blisters. These dressings are infused with antibacterial medical grade Manuka honey which improves the healing time for yourself or little ones. I had used Manuka Honey breast pads when I first started feeding the twins and had seen first-hand how powerful it was at healing as Manuka Honey is known for its natural healing properties. The use of medical grade Manuka honey in Comvita’s Medihoney Adhesive Dressings cleans the wound of dirt and bacteria and reduces the risk of infection. This means wounds can heal more quickly and are less likely to scar. Win-win. So, I have upped my dressing game and these bad boys have made their way into my first aid kits. Better yet they are waterproof (a must when you live at the beach) and latex free for sensitive skin. You too have the chance to bundle Comvita’s new Medihoney® Adhesive Dressings into your first aid kit as I have a Comvita prize pack to give away, valued at over $180, including the new range of dressings as well as a cool limited edition cardboard kids castle, sword, shield, and crown – all ready for your child to create their own fun! To enter head to my Facebook or Instagram page and follow the instructions on the Comvita post. So now you’re prepared for life’s little adventures (and the accompanying little accidents). Available in two sizes from pharmacies and www.comvita.co.nz nationwide, from RRP $15. This post was sponsored by Comvita but opinions are my own.